Taylor will take another year of level two. She's doing really well but needs some more work floating on her back. 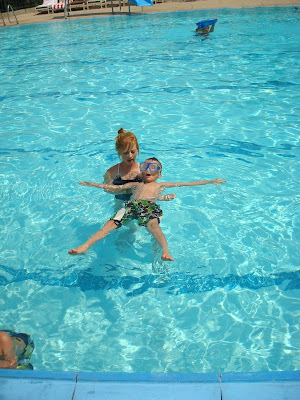 Karson passed off level 2 in swim lessons. Ya gotta love the goggles they ROCK!! He doesn't swim without them. I think it's because one he can see under water and two it plugs his nose for him. This is the BEST!! 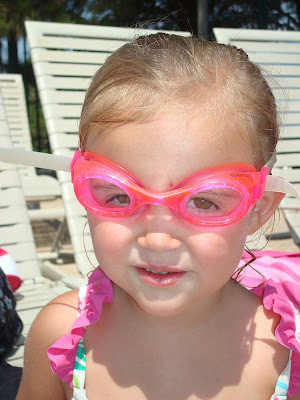 Hailee didn't like to go under the water with her face but she ware the goggles the whole time in swim lessons. Andrea took them off her and she had a ring around her eyes from being suctioned cupped to her face! So Funny!! 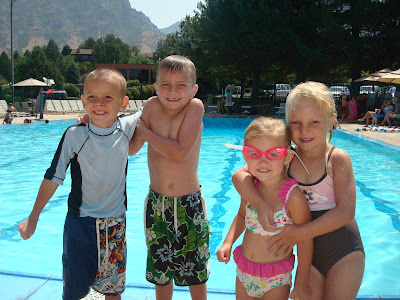 Karson and Taylor were able to take lessons with their cousins Cooper and Hailee this year which was much more fun! 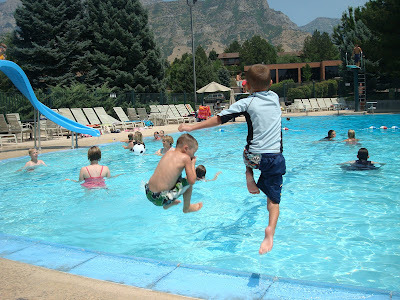 Karson and Cooper doing tricks while they jump in the water. Karson made a Bomb that he designed himself. He spent 3 weeks making it perfect. He had Uncle Vince help him set it off. 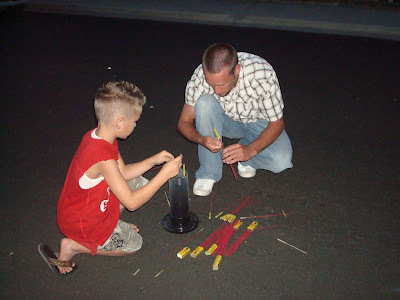 They put a bunch of those firecrackers in it so it makes a loud sound when it went off. Karson said "That was awesome" after it exploded. 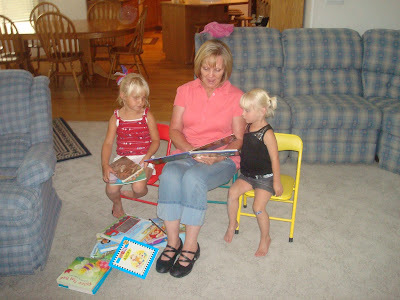 Even through all the action Taylor and Sophie take time to read books with Nanny! Taylor loves to look at book and to be read to. I love that she loves that. Karson is all about being involved!! 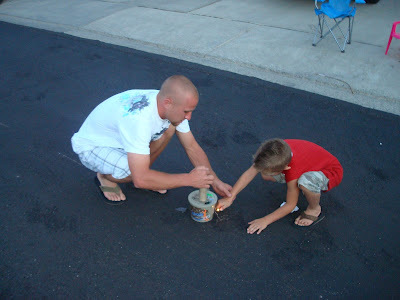 He helped Uncle Bri put Bottle Rockets in the Pipe to be lite off. What a little man he's becoming. So independent and so full of life and love.....I just love him. 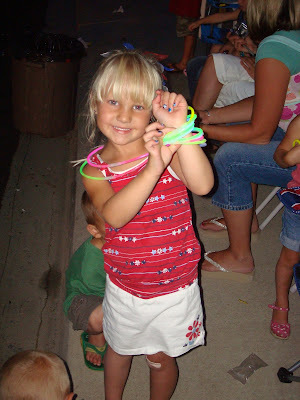 Little Miss all dolled up in the glow sticks. If my son could stay off high things that would be great! 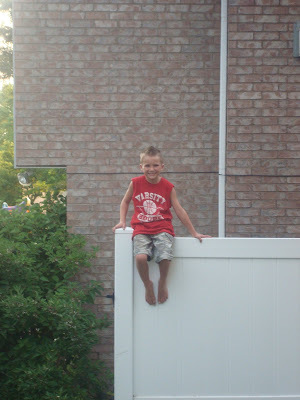 My heart drops when I see him up high even more so now since he fell 9 ft onto concrete! 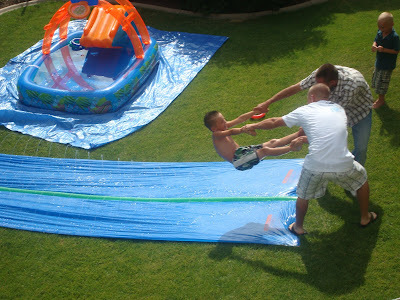 Vince and Brian set up the slip-n-slide and used Karson to make sure it's working properly.....and it was!! Happy Birthday to you, Happy Birthday to Andrea!!! 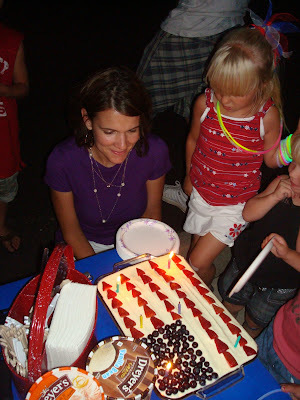 By the time we got done singing the kids had blown out all but two candles! 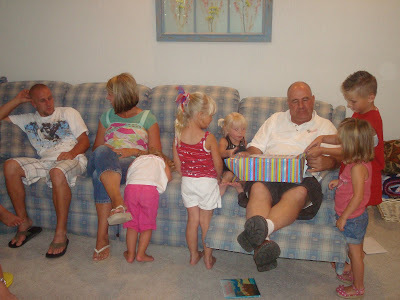 Happy Father's Day Dad! You amaze me and continue to amaze me. Thank you for raising us to love and respect each other. Janiece, Mike, Brian, Vince, Kristi and I share a special kind of relationship and that is a direct reflect on you and Mom! Your example is truly one to follow! Thanks for loving me and teaching me about life.....I'll never forget your saying "Fly with the crows, get shot with the crows". Pretty simple and straight to the point!!!! You're one in a MILLION! 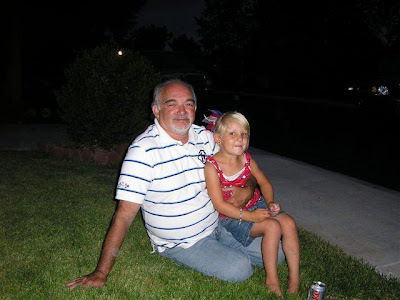 I Couldn't ask for a better Dad. I Love You!! 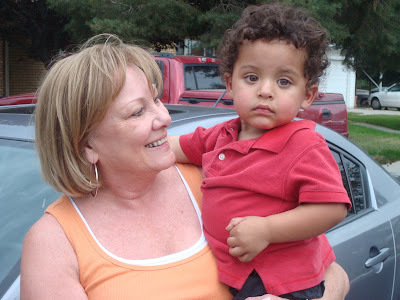 Jason's Aunt Stevie brought her grandson Jaxon down for the 4th of July. 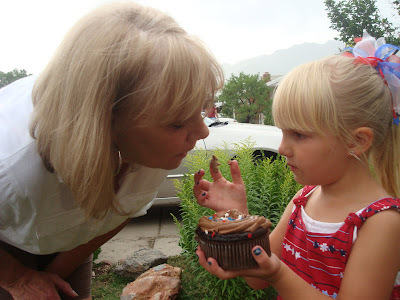 Taylor shared a "little" taste of her BIG HUGE cup cake with Grandma Ford. Jason Aunt Kelly comes all the way down here from Arizona to get help on her math homework?????????? lol Aunt Julie and cousin JB help her with her homework. 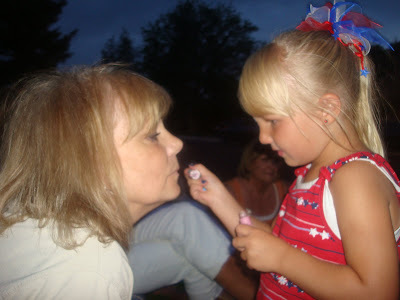 Taylor Aunt Nikki gave her some lip gloss so Taylor had to put some on everyone!! 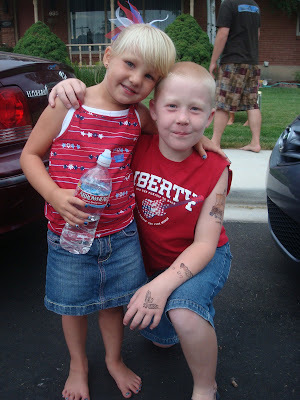 We went to Jasons mom's for a BBQ to celebrate the 4th of July. 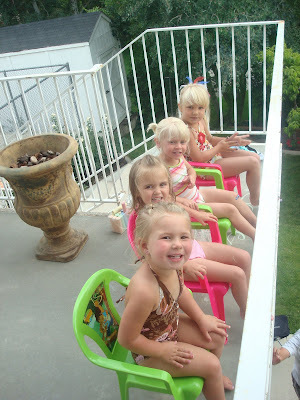 The kids were so excited to do fire works, play with their cousins and Aunts and Uncles. 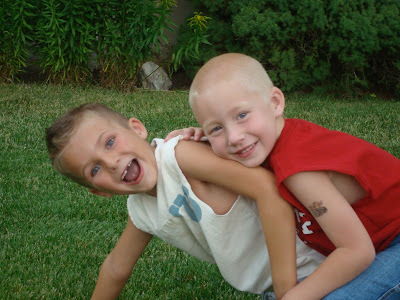 Taylor and Hudsun are little buddies! They love to play with each other and follow each other around everywhere. They are both so sweet and calm! 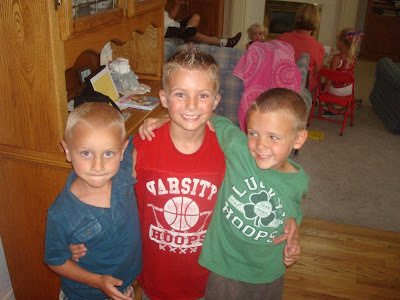 Karson and Brenner are little maniacs!!! 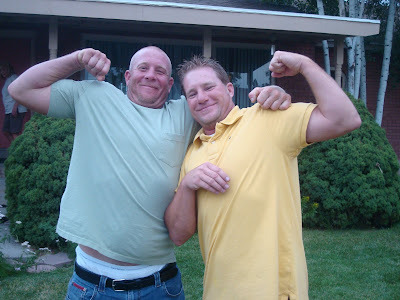 They bring out the rough in each other! They like to buddy around with each other!